Following its push toward lean manufacturing that began in 2007, foodservice-equipment manufacturer Winston Industries, Louisville, KY, took the next step in cooking up new productivity gains by investing in its first laser-cutting machine, in 2011. Compared to relying on aging turret presses to help fabricate its primarily stainless-steel products, laser cutting launched a new dawn at Winston. The SL4 combination machine (along the back wall) marries a 52-station punching machine with a multi-press head to a 2000-W fiber laser. Material comes from a pair of storage towers (upper left) at the entry end of the SL4, each capable of storing 15 varieties of sheet material type and thickness. The SL4 punches and laser cuts as required, and parts can either be removed at the SL4’s unload station and moved into work-in-process, or be directly routed to a Salvagnini P4 panel bender (foreground). 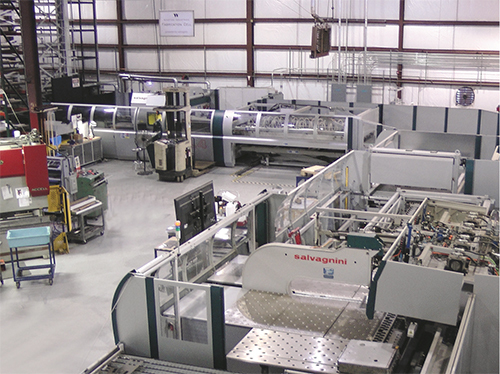 Less than 2 yr. later, early in 2013 Winston took another giant leap forward with laser cutting by adding a combination punch-press fiber-laser cutting machine (a Salvagnini SL4) to its fabrication shop. Fabricating components for its lineup of cooking and holding cabinets, drawers and the like, Winston works primarily with stainless steel (85 percent) as well as aluminum (10 percent) and galvanized steel (5 percent) in sheet thicknesses of 11 to 26 gauge. “The speed from the fiber laser is absolutely amazing,” shares Leavitt. “We thought that 11-gauge stainless would challenge the fiber laser, but it cuts the thicker material just fine. And we’ve cut aluminum sheet to 0.187 in. thick with the fiber laser without issue. Winston fabricates primarily stainless-steel sheetmetal, with some aluminum and galvanized-steel parts thrown into the mix. 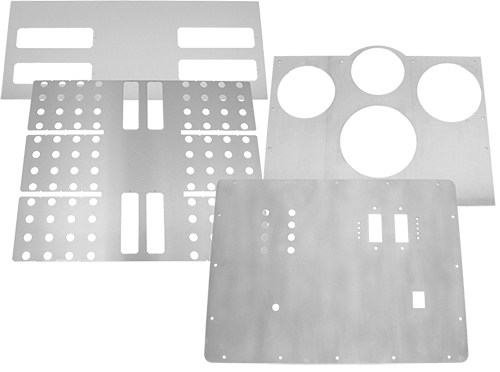 Shown (far left) are parts laser-cut and punched on the SL4 from 18-gauge Type 304 stainless, and parts fabricated from Type 3003 aluminum (0.125 and 0.090 in. thick). The SL4 combination machine marries a 52-station punching machine with a multi-press head (no stopping for tool changes) to a 2000-W fiber laser. Material comes from a pair of storage towers at the entry end of the SL4, each capable of storing 15 varieties of sheet material type and thickness; fully loaded the towers hold 68,000 lb. of material. The SL4 punches and laser cuts as required to fulfill the nest requirements, switching between laser cutting and punching as needed to optimize cycle times. Parts from the SL4 can either be removed at the SL4’s unload station and moved into work-in-process for downstream bending operations, or be directly routed to a Salvagnini P4 panel bender located next to the SL4. It’s hard to imagine what Colonel Sanders would have thought about laser cutting of sheetmetal back in 1969, when Kentucky Fried Chicken worked with Winston Industries to develop its revolutionary pressure fryer. Fast forward to 2014 and there’s no looking back at old metal-fabricating technology, only a bright future for the now laser-based fabrication shop at Winston. 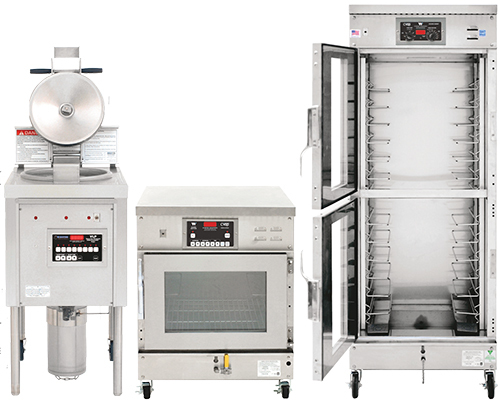 Winston Industries, the company that helped Colonel Sanders launch his KFC franchise by working together to develop the pressure fryer, now manufactures a full slate of foodservice equipment. Prior to embarking on its lean journey in 2007, Leavitt calculates that the typical piece of sheetmetal traveled 1600 ft. before leaving the 75,000-sq.-ft. Winston plant. Assembly lines occupied the center of the 60,000-sq.-ft. factory (400 ft. long by 150ft. wide), surrounded by fabricating and other equipment located on the perimeter. “Value-stream mapping led us to significantly alter the factory layout (in 2011), which shortened the average piece-part travel distance to just 550 ft.,” says Leavitt. And, prior to reorganizing its process flow, the plant had focused on reducing turret-press setup times and implementing offline programming. All told, by Leavitt’s calculations, the plant improved productivity by 15 percent by focusing on turret-press setup and programming, and another 15 percent when it reorganized its process flow. In 2012, with its initial laser acquisition, productivity jumped another 3 percent; the SL4 and P4 additions added a whopping 19 percent to the plant’s productivity. “That’s a 52 percent jump in productivity in just 5 yr.,” exclaims Leavitt. As a result, material utilization jumped from 73 percent to near 90 percent. As Winston purchases more than $2 million worth of stainless steel per year, Leavitt estimates that the gain in utilization saves the firm more than $230,000 annually. Along with supporting inhouse needs for sheetmetal components, Leavitt sees opportunities to market the capabilities of the SL4 and P4 machines to other manufacturers. For example, Winston Industries, in addition to its catalog of foodservice equipment, also manufactures electronic circuit boards, cable and wire harnesses for several customers, through its Win2uit manufacturing-services subsidiary. Leavitt says that as Win2uit customers visit Winston and witness the performance of the Salvagnini equipment, “they often ask us if we can fabricate their sheetmetal enclosures in addition to their electronic components,” he adds. “We’ve picked up 30 to 35 new sheetmetal-fabrication customers for our new equipment, primarily low-volume (up to a few hundred parts) quick-turnaround (3-4 days) work.